Mystery surrounds the death in London of a protégé of celebrity chef Gordon Ramsay. David Dempsey, 31, was found dead outside a flat in Elm Park Gardens, just off the Kings Road in Chelsea, south west London, on Sunday. He is reported to have fallen from a second floor flat window after attempting a series of "cat burglaries". 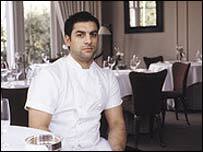 Mr Dempsey had recently moved to London from Glasgow, where he was head chef at Mr Ramsay's Amaryllis restaurant. He had become head chef at the flagship restaurant Gordon Ramsay on the Royal Hospital Road, in Chelsea. Mr Dempsey had trained under Mr Ramsey and Raymond Blanc and leaves a partner and young children. A police source is quoted in several newspapers as saying he climbed onto scaffolding to break into flats in the wealthy borough. He is said to have been challenged by an occupant and a struggle took place. The chef broke free then fell to the ground from a nearby window. No further explanation can be given for his behaviour but the results of a post-mortem examination may shed light on the reasons, the source added. A spokeswoman for Mr Ramsay said the chef was "devastated" and said all his sympathy was with Mr Dempsey's family. A statement, released on behalf of Mr Ramsay, added: "David was the inspiration behind the launch of Amaryllis in Glasgow and went on to win Glasgow's only Michelin star. "In the last few weeks David had come down to London to take over at Royal Hospital Road, Gordon's flagship restaurant in London, as head chef. "His loss will be felt deeply by all of us who worked with him over the past years and we extend our sincerest compassion to his family."